In France under the Old Regime, the Estates General (French: États généraux) or States-General was a legislative and consultative assembly (see The Estates) of the different classes (or estates) of French subjects. It had a separate assembly for each of the three estates (clergy, nobility and commoners), which were called and dismissed by the king. It had no true power in its own right—unlike the English parliament it was not required to approve royal taxation or legislation—instead it functioned as an advisory body to the king, primarily by presenting petitions from the various estates and consulting on fiscal policy. The Estates General met intermittently until 1614 and only once afterwards, in 1789, but was not definitively dissolved until after the French Revolution. It is comparable to similar institutions across Europe, such as the States General of the Netherlands, the Parliament of England, the Estates of Parliament of Scotland, the Cortes of Portugal or Spain, the Imperial Diet ("Reichstag") of the Holy Roman Empire or Germanic Empire, the Diets (German: Landtage) of the "Lands", and the Swedish Riksdag of the Estates. In one sense, the composition and powers of the Estates General always remained the same. They always included representatives of the First Estate (clergy), Second Estate (the nobility), and Third Estate (commoners: all others), and monarchs always summoned them either to grant subsidies or to advise the Crown, to give aid and counsel. Their composition, however, as well as their effective powers, varied greatly at different times. In their primitive form in the 14th and the first half of the 15th centuries, the Estates General had only a limited elective element. The lay lords and the ecclesiastical lords (bishops and other high clergy) who made up the Estates General were not elected by their peers, but directly chosen and summoned by the king. In the order of the clergy, however, since certain ecclesiastical bodies, e.g. abbeys and chapters of cathedrals, were also summoned to the assembly, and as these bodies, being persons in the moral but not in the physical sense, could not appear in person, their representative had to be chosen by the monks of the convent or the canons of the chapter. It was only the representation of the Third Estate which was furnished by election. Originally, the latter was not called upon as a whole to seek representation in the estates. It was only the bonnes villes, the privileged towns, which were called upon. They were represented by elected procureurs, who were frequently the municipal officials of the town, but deputies were often elected for the purpose. The country districts, the plat pays, were not represented. Even within the bonnes villes, the franchise was quite narrow. The effective powers of the Estates General likewise varied over time. In the 14th century they were considerable. The king could not, in theory, levy general taxation. Even in the provinces attached to the domain of the Crown, he could only levy it where he had retained the haute justice over the inhabitants, but not on the subjects of lords having the haute justice. The privileged towns had generally the right of taxing themselves. To collect general taxes, the king required consent of the lay and ecclesiastical lords, and of the towns. This amounted to needing authorization from the Estates General, which only granted these subsidies temporarily for fairly short periods. As a result, they were summoned frequently and their power over the Crown became considerable. In the second half of the 14th century, however, certain royal taxes, levied throughout the Crown's domain, tended to become permanent and independent of the vote of the estates. This sprang from many causes, but from one in particular; the Crown endeavoured by transforming and changing the nature of the "feudal aid" to levy a general tax by right, on its own authority, in such cases as those in which a lord could demand feudal aid from his vassals. For instance, it was in this way that the necessary taxes were raised for twenty years to pay the ransom of King John II of France without a vote of the Estates General, although they met several times during this period. Custom confined this tendency. Thus during the second half of the 15th century the chief taxes, the taille, aids and gabelle became definitely permanent for the benefit of the Crown, sometimes by the formal consent of the Estates General, as in 1437 in the case of the aids. The critical periods of the Hundred Years' War favoured the Estates General, though at the price of great sacrifices. Under the reign of King John II they had controlled, from 1355 to 1358, not only the voting, but through their commissaries, the administration of and jurisdiction over the taxes. In the first half of the reign of Charles VII they had been summoned almost every year and had dutifully voted subsidies. But when the struggle was over they renounced, through weariness and a longing for peace, their most precious right, the power of the purse. At the estates of 1484, however, after the death of Louis XI, the Duke of Orleans sought to obtain the regency during the minority of Charles VIII, but the Estates sided with Charles's sister Anne de Beaujeu and refused. Deputies of the three orders united their efforts in the hope of regaining the right of periodically sanctioning taxation. They voted the taille for two years only, at the same time reducing it to the amount it had reached at the end of the reign of Charles VII. They even demanded, and obtained, the promise of the Crown that they should be summoned again before the expiration of the two years. But the promise was not kept, and the Estates General were not summoned again until 1560. There was thus a 76-year interim, during which successive kings expanded the role of the centralised state through various means. The Estates General was revived in the second half of the 16th century because of scarcity of money and the quarrels and Wars of Religion. The estates of Orléans in 1560, followed by those of Pontoise in 1561, and those of Blois in 1576 and 1588 were most remarkable for the wisdom, courage and efforts of the deputies, but on the whole were lacking in effect. Those of 1588 ended with a regular coup d'etat effected by Henry III, and the States summoned by the League, which sat in Paris in 1593 and whose chief object was to elect a Catholic king, were not a success. The Estates General again met in Paris in 1614, on the occasion of the disturbances that followed the death of Henry IV; however, though their minutes bear witness to their sentiments of exalted patriotism, dissensions between the three orders rendered them weak. They dissolved before completing their work and were not summoned again until 1789. As to the question whether the Estates General formed one or three chambers for the purposes of their working, from the constitutional point of view the point was never decided. What the king required was to have the consent, the resolution of the three estates of the realm; it was in reality of little importance to him whether their resolutions expressed themselves in common or separately. At the Estates General of 1484 the elections were made in common for the three orders, and the deputies also arrived at their resolutions in common. But after 1560 the rule was that each order deliberate separately; the royal declaration of 23 June 1789 (at the outbreak of the French Revolution) even stated that they formed three distinct chambers. But Necker's report to the conseil du roi according to which the convocation of 1789 was decided, said (as did the declaration of 23 June), that on matters of common interest the deputies of the three orders could deliberate together, if each of the others decided by a separate vote in favour of this, and if the king consented. The working of the Estates General led to an almost exclusive system of deliberation by committees. There were, it is true, solemn general sessions, called séances royales, because the king presided; but at these there was no discussion. At the first, the king or his chancellor announced the object of the convocation, and set forth the demands or questions put to them by the Crown; at the other royal sessions each order made known its answers or observations by the mouth of an orateur elected for the purpose. But almost all useful work was done in the sections, among which the deputies of each order were divided. At the estates of 1484 they were divided into six nations or sections, corresponding to the six généralités then existing. Subsequently, the deputies belonging to the same gouvernement formed a group or bureau for deliberating and voting purposes. Certain questions, however, were discussed and decided in full assembly; sometimes, too, the estates nominated commissaries in equal numbers for each order. But in the ancient Estates General there was never any personal vote. The unit represented for each of the three orders was the bailliage or sénéchaussé and each bailliage had one vote, the majority of the deputies of the bailliage deciding in what way this vote should be given. The Estates General, when they gave counsel, had in theory only a consultative faculty. They had the power of granting subsidies, which was the chief and ordinary cause of their convocation. But it had come to be a consent with which the king could dispense, as permanent taxation became established. In the 16th century, however, the estates again claimed that their consent was necessary for the establishment of new taxation, and, on the whole, the facts seemed to be in favour of this view at the time. However, in the course of the 17th century the principle gained recognition that the king could tax on his own sole authority. Thus were established in the second half of the 17th century, and in the 18th, the direct taxes of the capitation and of the dixième or vingtième, and many indirect taxes. It was sufficient for the law creating them to be registered by the cours des aides and the parlements. It was only in 1787 that the parlement of Paris declared that it could not register the new taxes, the land-tax and stamp duty (subvention territoriale and impôt du timbre), as they did not know whether they would be submitted to by the country, and that the consent of the representatives of the tax-payers must be asked. The Estates General had legally no share in the legislative power, which belonged to the king alone. The Estates of Blois demanded in 1576 that the king be bound to turn into law any proposition voted in identical terms by each of the three orders; but Henry III would not grant this demand, which would not even have left him a right of veto. In practice, however, the Estates General contributed largely to legislation. Those who sat in them had at all times the right of presenting complaints (doléances), requests and petitions to the king; in this, indeed, consisted their sole initiative. They were usually answered by an ordonnance, and it is chiefly through these that we are acquainted with the activity of the estates of the 14th and 15th centuries. In the latest form, and from the estates of 1484 onwards, this was done by a new and special procedure. The Estates had become an entirely elective assembly, and at the elections (at each step of the election if there were several) the electors drew up a cahier de doléances (statement of grievances), which they requested the deputies to present. This even appeared to be the most important feature of an election. The deputies of each order in every bailliage also brought with them a cahier des doléances, arrived at, for the third estate, by a combination of statements drawn up by the primary or secondary electors. On the assembly of the estates the cahiers of the bailliages were incorporated into a cahier for each gouvernement, and these again into a cahier general or general statement, which was presented to the king, and which he answered in his council. When the three orders deliberated in common, as in 1484, there was only one cahier général; when they deliberated separately, there were three, one for each order. The drawing up of the cahier general was looked upon as the main business (le grand cause) of the session. By this means the Estates General furnished the material for numerous ordonnances, though the king did not always adopt the propositions contained in the cahiers, and often modified them in forming them into an ordonnance. These latter were the ordonnances de reforme (reforming ordinances), treating of the most varied subjects, according to the demands of the cahiers. They were not, however, for the most part very well observed. The last of the type was the grande ordonnance of 1629 (Code Michau), drawn up in accordance with the cahiers of 1614 and with the observations of various assemblies of notables that followed them. The peculiar power of the Estates General was recognized, but was of a kind that could not often be exercised. It was, essentially, a constituent power. The ancient public law of France contained a number of rules called "the fundamental laws of the realm" (lois fondamentales du royaume), though most of them were purely customary. Chief among these were rules that determined the succession to the Crown and rules forbidding alienation of the domain of the Crown. The king, supreme though his power might be, could not abrogate, modify or infringe them. But it was admitted that he might do so by the consent of the Estates General. The Estates could give the king a dispensation from a fundamental law in a given instance; they could even, in agreement with the king, make new fundamental laws. The Estates of Blois of 1576 and 1588 offer entirely convincing precedents in this respect. It was universally recognized that in the event of the line of Hugh Capet becoming extinct, it would be the function of the States-General to elect a new king. The Estates General of 1614 proved the last for over a century and a half. A new convocation had indeed been announced to take place on the majority of Louis XIII, and letters were even issued in view of the elections, but this ended in nothing. Absolute monarchy progressively became definitely established, and appeared incompatible with the institution of the Estates General. Liberal minds, however, in the entourage of Louis, duc de Bourgogne, who were preparing a new plan of government in view of his expected accession to the French throne in succession to Louis XIV, thought of reviving the institution. It figures in the projects of Saint-Simon and Fénelon though the latter would have preferred to begin with an assembly of non-elected notables. But though St Simon stood high in the favor of the regent Orléans, the death of Louis XIV did not see a summoning of the Estates. At the time of the revolution, the First Estate comprised 10,000 Catholic clergy and owned 5–10% of the lands in France—the highest per capita of any estate. All property of the First Estate was tax exempt. The Second Estate comprised the nobility, which consisted of 400,000 people at the time, including women and children. Since the death of Louis XIV in 1715, the nobles had enjoyed a resurgence in power. They had almost a monopoly over distinguished government service, higher church offices, army parliaments, and most other public and semipublic honors by the time of the revolution. Like the First Estate, they were not taxed by the principle of feudal precedent. The Third Estate comprised about 25 million people: the bourgeoisie, the peasants, and everyone else in France. 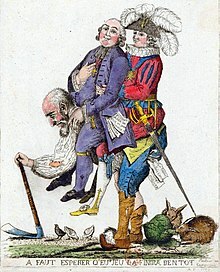 Unlike the First and Second Estates, the Third Estate were compelled to pay taxes, but the bourgeoisie found one way or another to be exempt from them. The heavy burden of the French government therefore fell upon the poorest in French society—the peasantry, the working poor, and the farmers. There was much resentment from the Third Estate towards its superiors. In 1789, the Estates General was summoned for the first time since 1614. As Fénelon had wished in former days, an Assembly of Notables in 1787 (which already displayed great independence) preceded the Estates General session. According to the model of 1614, the Estates General would consist of equal numbers of representatives of each Estate, but the Third Estate demanded, and ultimately received, double representation, which they already had in the provincial assemblies. When the Estates General convened in Versailles on 5 May 1789, however, it became clear that the double representation was something of a sham: voting was to occur "by orders", which meant that the collective vote of the 578 representatives of the Third Estate would be weighed the same as that of each of the other Estates. Royal efforts to focus solely on taxes failed totally. The Estates General reached an immediate impasse, debating (with each of the three estates meeting separately) its own structure rather than the nation's finances. On 28 May 1789, Abbé Sieyès moved that the Third Estate, now meeting as the Communes (English: Commons), proceed with verification of its own powers and invite the other two estates to take part, but not to wait for them. They proceeded to do so, completing the process on June 17. Then they voted a measure far more radical, declaring themselves the National Assembly, an assembly not of the Estates but of "the People". They invited the other orders to join them, but made it clear that they intended to conduct the nation's affairs with or without them. King Louis XVI of France tried to resist. When he shut down the Salle des États where the Assembly met, the Assembly moved their deliberations to a nearby tennis court, where they proceeded to swear the Tennis Court Oath (20 June 1789), under which they agreed not to separate until they had given France a constitution. A majority of the representatives of the clergy soon joined them, as did forty-seven members of the nobility. By 27 June the royal party had overtly given in, although the military began to arrive in large numbers around Paris and Versailles. Messages of support for the Assembly poured in from Paris and other French cities. On 9 July the Assembly reconstituted itself as the National Constituent Assembly. Wikimedia Commons has media related to French States-General. ^ a b Kiser, Edgar; April Linton (Dec 2002). "The hinges of history: state-making and revolt in early modern France". American Sociological Review. 67 (6): 889–910. doi:10.2307/3088975. JSTOR 3088975. ^ Robin, Larsen and Levin. Encyclopedia of women in the Renaissance: Italy, France, and England. p. 42. This article incorporates text from a publication now in the public domain: Chisholm, Hugh, ed. (1911). "States-General". Encyclopædia Britannica (11th ed.). Cambridge University Press.